Dialogue committees’ members from the Pakistan Muslim League – Nawaz (PML-N) government and Tehreek-e-Taliban Pakistan (TTP) on Wednesday agreed that the dialogue process had entered a decisive stage and the TTP negotiators will most likely hold a meeting with Prime Minister Nawaz Sharif today (Thursday). However, after differences emerged in the TTP committee, the dialogue committee representing PML-N government also stands divided over its future role as its members have divergent views over the way forward, Pakistan Today has learnt. Sources privy to the developments told Pakistan Today that Major (r) Amir, the man responsible for making a breakthrough in talks with TTP, has proposed to the prime minister to dissolve the committee as the mandate given to the committee had been achieved. However, the sources said the coordinator of the talks committee, Irfan Siddiqui wanted a future role for the committee and he was influencing the prime minister for the same. “During their recent meeting with the prime minister, Maj Amir proposed to the prime minister to dissolve the committee as its goal had been achieved and both the parties had agreed to hold face-to-face meetings to take major decisions. So there was no need for the committee which was meant to perform facilitator’s role,” the source said, adding that the prime minister also agreed to the idea but asked the committee members to keep working till he takes a final decision in this regard. Sources said that rather than dissolving the committee, Siddiqui had proposed the premier to include representatives of army and the Khyber Pakhtunkhwa government under his leadership while he also insists on the inclusion of Interior Minister Chaudhry Nisar Ali Khan in the government’s negotiating team. “However, Nisar is reluctant in becoming a member of the government’s negotiating panel which would be led by Siddiqui. Both the gentlemen are not at good terms since Siddiqui had got cancelled a luncheon meeting arranged by the interior minister for government’s negotiating panel,” sources added. The differences between the committee members further came to the fore when Siddiqui was asked by journalists on Wednesday at Akora Khattak whether the committee was being dissolved as proposed by the committee members or not. When contacted, Maj Amir confirmed the news to Pakistan Today that he had submitted a proposal to the prime minister who had assured him to consider it. However, he rubbished the notion that the committee members stood divided over his proposal and that the coordinator was opposing his proposal. He added that no committee member had differed with his proposal during the meeting. “Since the committee has performed its duty of facilitation, now a new phase has started wherein the fundamental stakeholders i.e. the army, Khyber Pakhtunkhwa chief minister, governor and others should hold direct talks with the Taliban,” he said. “There is no division over the proposal,” he maintained. Asked whether the army was ready to join the dialogue process, Amir said that he had no information about the views of the army leadership but asserted that the army in past had held direct talks with the Taliban while it had also held talks with the TTP indirectly with the government taking a lead role. “This is the phase where major decisions have to be taken. For instance, if TTP wants withdrawal of army from FATA, this decision should be taken by the army itself and also by the political leadership. Likewise, any compensation in Swat is to be agreed upon by Khyber Pakhtunkhwa chief minister while any decision about FATA is to be made by the KP governor. So there is no role of committee now and all decisions have to be taken by both sides,” he explained. He said that since the TTP leadership was also ready to hold direct talks, there was no role for committees to represent the rival factions now. Asked whether he was optimistic about a deal between the government and the TTP, Amir said that the objective of the committee was to acquire peace and he was hopeful for success of the dialogue process. “As a man of peace, I believe and pray for peace,” he concluded. Meanwhile, the meeting between negotiators from the government and the TTP concluded in Akora Khattak with both sides agreeing to certain terms and conditions. This was the first meeting after the dialogue hit snags following slaying of 23 FC men at the hands of TTP some two weeks back. The government’s negotiating team had refused to carry the talks forward as a part of the protest against the killings while the army had conducted airstrikes in parts of North Waziristan to avenge the killings as well. However, hope for peace was rekindled when the TTP spokesman announced a one-month ceasefire which was reciprocated by the government. Following the meeting, head of TTP dialogue committee Maulana Samiul Haq told reporters that attempts would be made to sabotage the efforts of the intermediary committees with regards to the peace talks. He said that the “third enemy” will definitely do something to create obstacles, adding that the USA, India and Afghanistan did not want the peace negotiations to be successful. 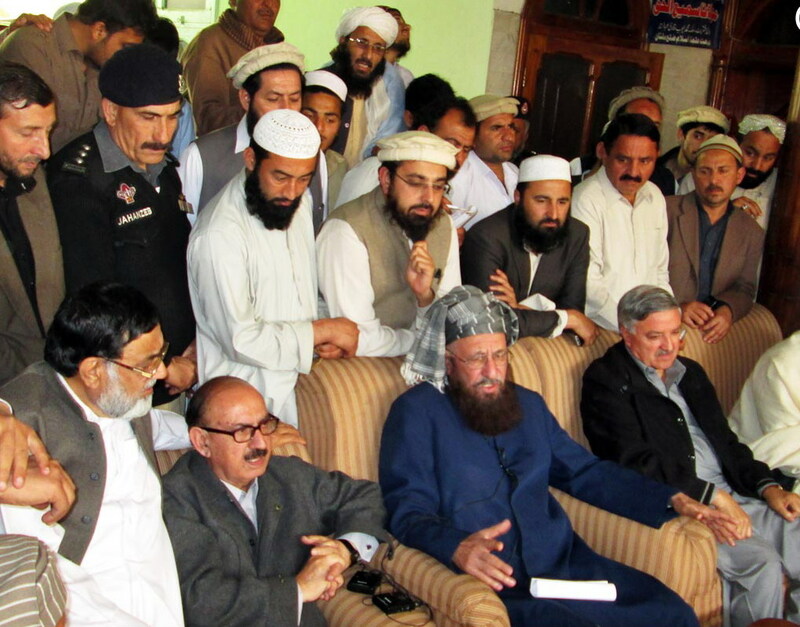 The JUI-S chief also said that TTP has not asked for changes in the Constitution of Pakistan or the existing system. He also remarked that the intermediary committees had to open the door for dialogue process and they have successfully done so, further stating that it was now up to the government and the TTP to make decisions. The JUI-S chief opposed any military operation by the government in North Waziristan, saying that a military operation was not the solution and it should not be launched regardless of any pressure from various powers. Haq also said that the intermediary committees should be autonomous in making decisions with regards to the talks. The Mullah representing Talebans at least succeeded to realize their long time dream-wish; A Trip to PM House, with free 7-star breakfast. Though it becomes late.